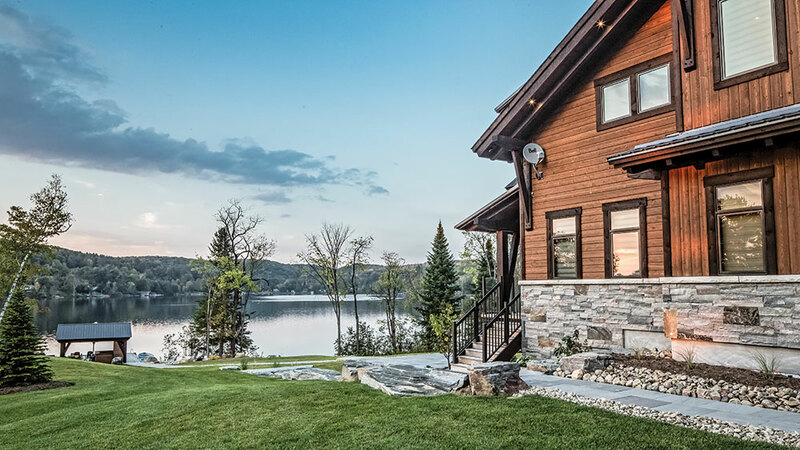 Cruise around the more than 100 miles of shoreline at Lake of Bays in Ontario, Canada, and you’ll quickly notice a keen resemblance between the homes that dot the lake’s picturesque perimeter. 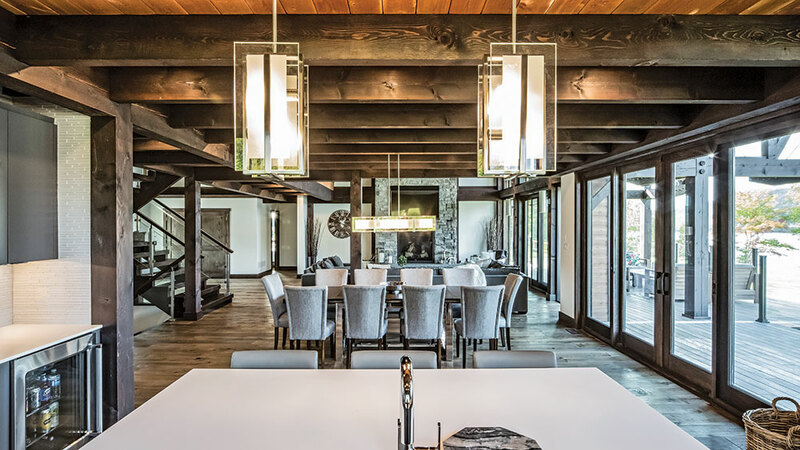 Along the lakefront, Jeff and his team incorporated a two-level covered deck with plenty of space for spreading out and spending time with family and friends. 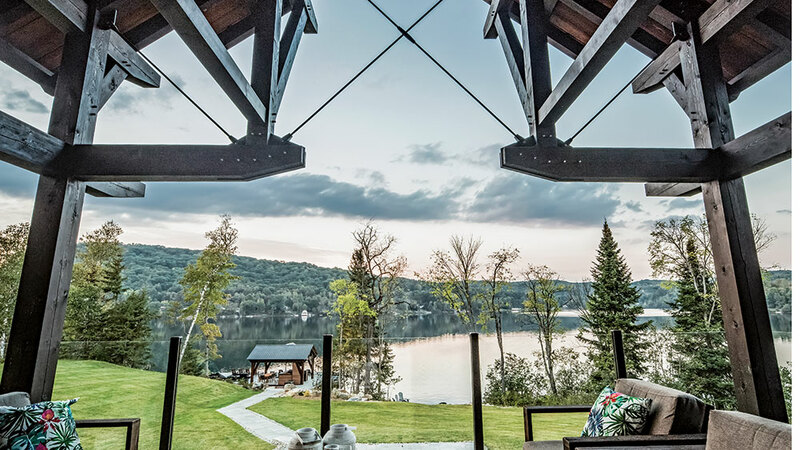 There’s also a spacious screened-in porch (a smart solution during the buggy spring and summer months), a large firepit in the back yard, a regulation-size beach volleyball court and a covered, timber-framed boat port down by the water — and that’s all before you even step inside the home’s 6,900 square feet of living space. 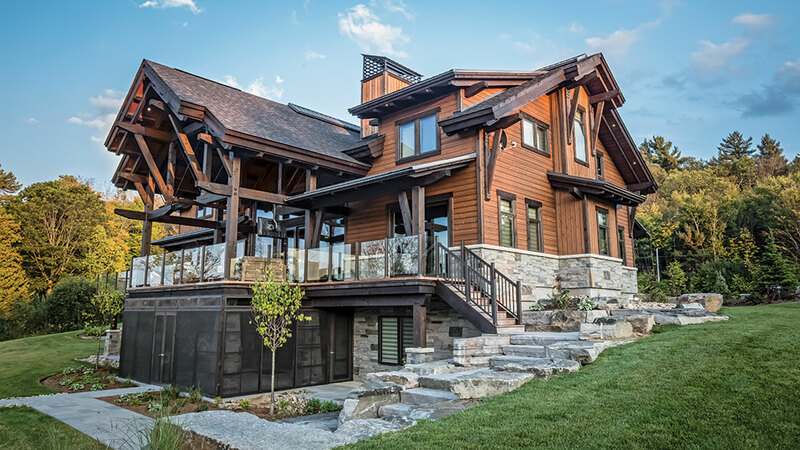 The custom floor plan was based on Canadian Timberframes’ Elk River design that features two upper-level master suites separated by a catwalk, two upper-level bedrooms (located over the three-car garage) and four more guest bedrooms on the main and lower levels of the home. 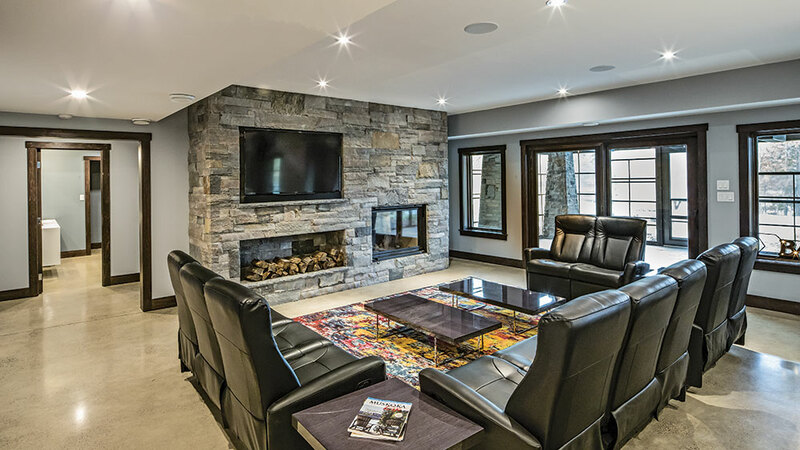 An open layout and spacious walk-out recreational area make the home perfect for hosting large groups of people on weekends spent away from the owners’ main residence in Toronto. The home has a modern, contemporary feel. Given the location of property, the outdoor areas were equally important as the interior and added even more living space. There’s a space in the basement/back exterior that houses the recreational water equipment. 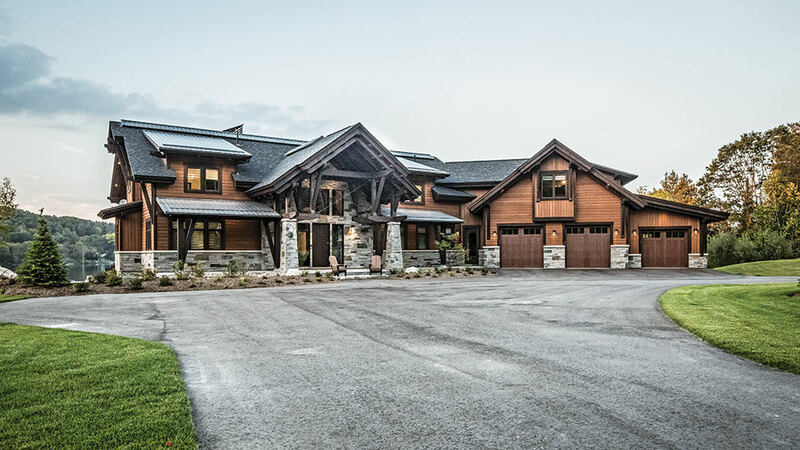 The main section of the home, from front to back, is all full timber frame. “It’s more of a hybrid situation in the wings, where we’ve introduced some of the timber work with structural wall systems,” explains Jeff. Under the garage, a walk-out holds small boats, kayaks and water skiing equipment. 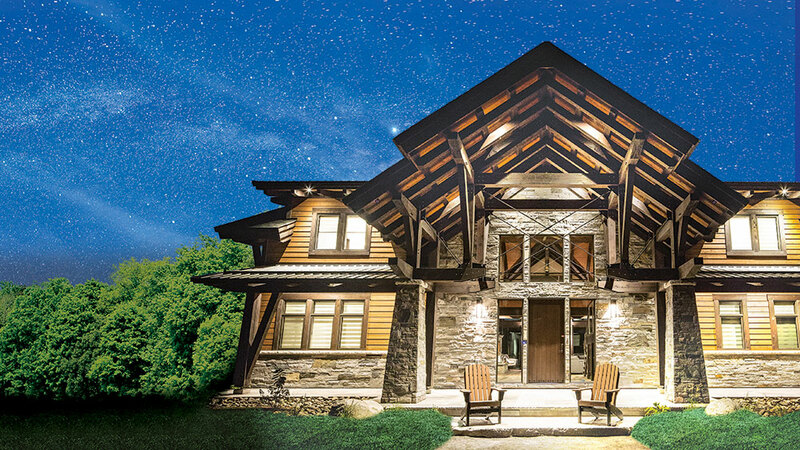 Contrasting light and dark stains allow the timbers to pop off the ceiling and trim work. 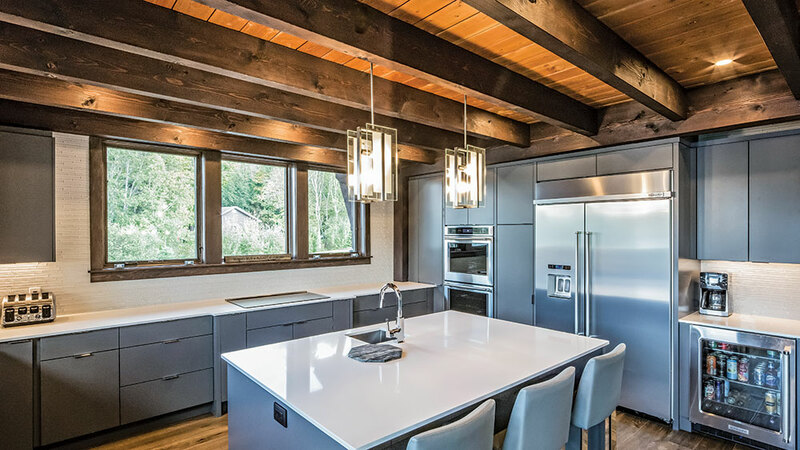 A cool gray-blue hue and a sleek, clean design on the cabinet doors lend a highly modern counterpoint to the ruggedly natural beams overhead and rich hardwood floors beneath. From the kitchen, the owners have a clear line of sight through the dining area, landing on the central fireplace. 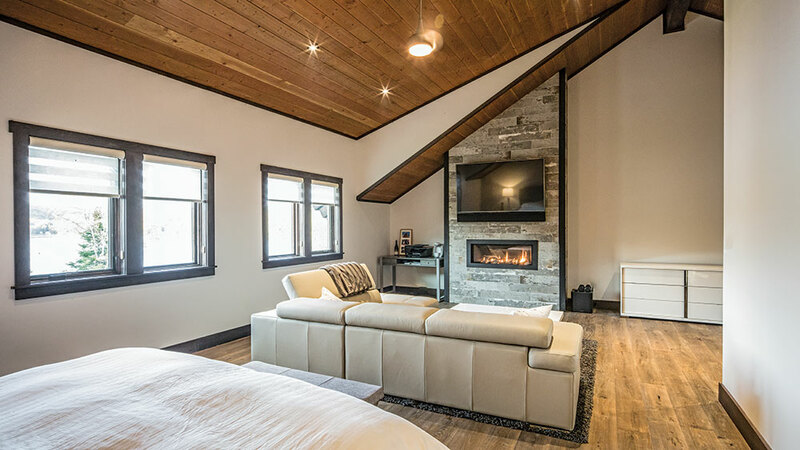 “After looking at samples and figuring out what our client liked and didn’t like, we ultimately went with a hybrid mix, featuring structural timbers in the special areas and stick-built construction in the bedrooms,” Jeff explains. 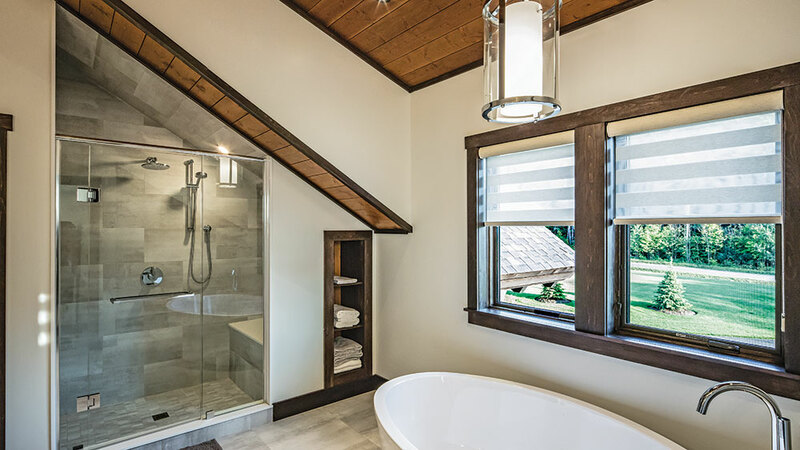 The slanted shower ceiling adds a modern touch to the main bath. 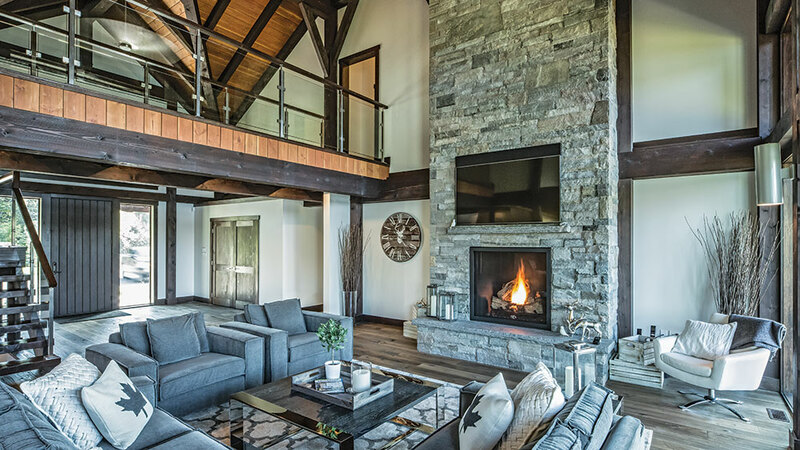 The combination of rustic and modern touches throughout the home give the structure a unique and personal touch. 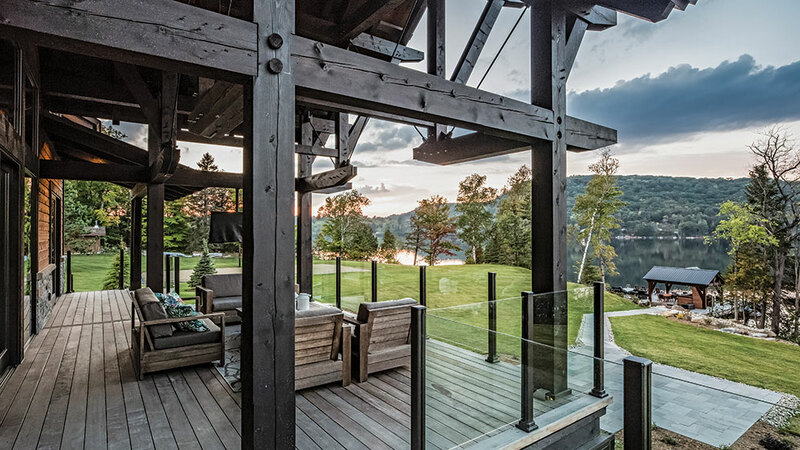 What a perfect backyard view! 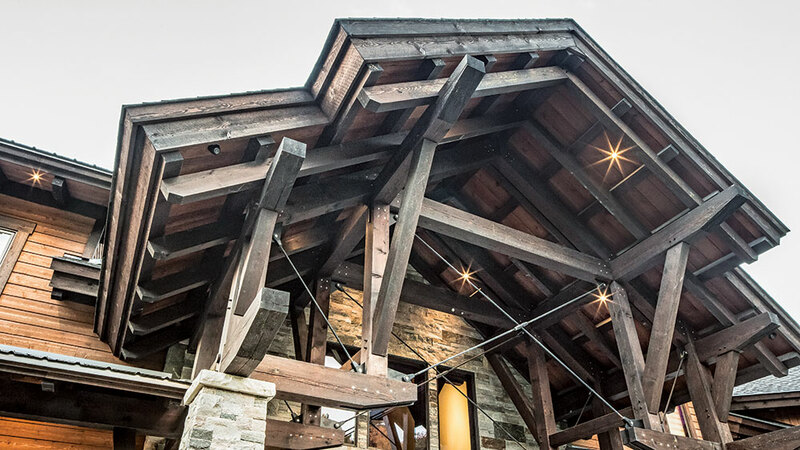 Other material decisions include vaulted tongue-and-groove ceilings, dark-stained timbers (found on both the interior and exterior of the home) and lots of structural steel plates and cables, an element that allows for larger expanses and more flexibility with the timbers. 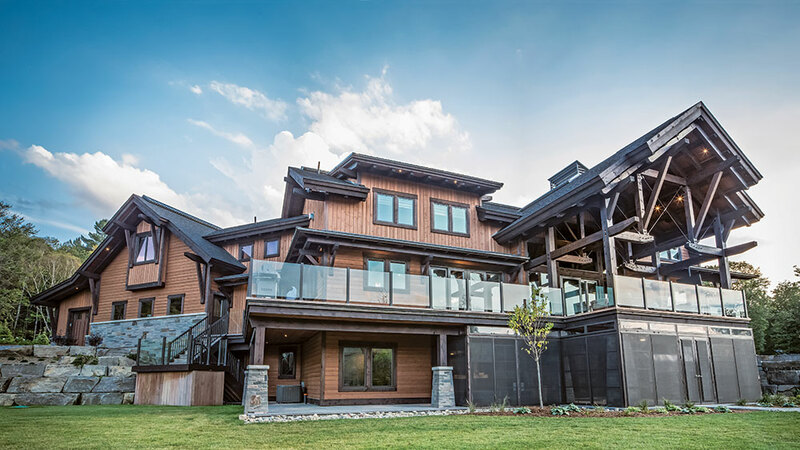 “The intricate, heavy-timber style is definitely something we see more of in the West. It’s big, bold, exciting — it definitely turns heads,” says Jeff Bowes.